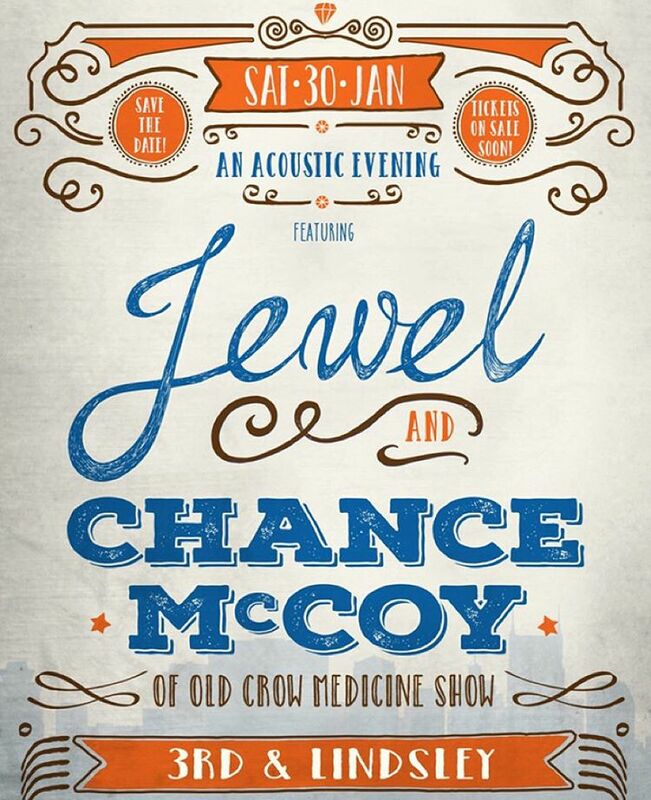 Multi-award-winning superstar Jewel and Chance McCoy of Old Crow Medicine Show will be performing at 3rd & Lindsley for one night only. Don't miss this incredible opportunity to enjoy an unforgettable evening with these talented artists in an intimate, 380-seat venue. Limited VIP Packages available. VIP Platinum Package - Lower Level - $150 per person - Includes pre-show backstage meet-and-greet with the artists, plus 2 free drinks per person, and a seat at a premium reserved table on the level closest to the stage. Sold in pairs. Seated in tables of 4. VIP Gold Package - Main Level - $100 per person - Includes 1 free drink per person and a seat at a reserved table on the main level. Sold in pairs. Seated in tables of 6. General Admission tickets available for $55 with no reserved seating. 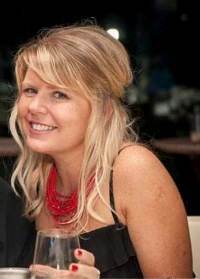 A very limited number of premium sponsorship packages are available - please contact Tricia Drake, Development Coordinator, at tdrake@lindenwaldorf.org or 615-354-0270 ext. 26 to learn more and reserve your tickets. This is a perfect opportunity to promote your business while you entertain associates or colleagues. Just bought my VIP Meet & Greet tickets for this show. These VIP M&G tickets are only available as pairs, two. 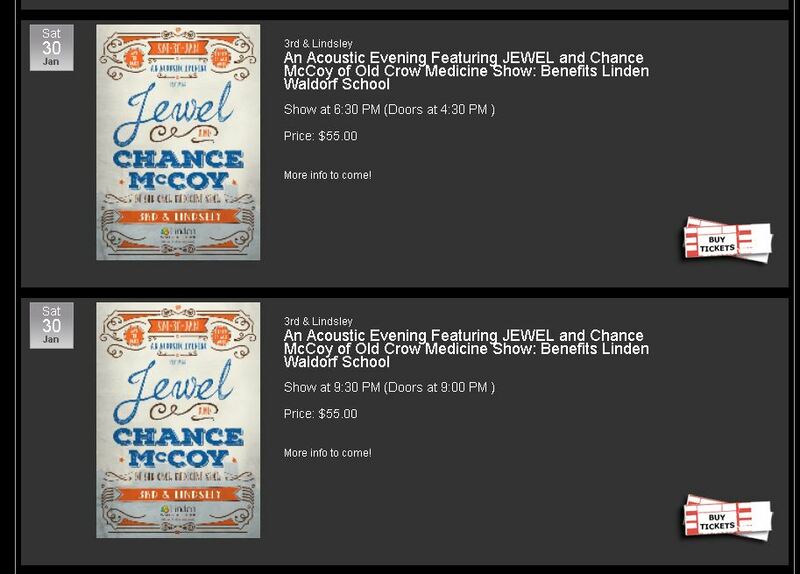 EDAs, if you can make it to this Show, 30 Jan. 2016, at 3rd and Lindsley in Nashville, I have an extra ticket. Let me know. Nice! I hope you'll have a great show together with another EDA! EDAs, if you can make it to this Show, 30 Jan. 2016, at 3rd and Lindsey in Nashville, I have an extra ticket. Let me know. So so so tempted right now... I want to go!! I can imagine Jess, It is a really really nice opportunity Joe is ging over here. I have a friend in Nashville who's been wanting me to come visit - she texted me yesterday & asked if I was coming to this show. I told her I'd look into it...and after doing that, there's no way in hell I'm paying that much for a show at 3rd & Lindsley! It's been a long time since I've been there, but as I recall, it was a pretty dive-y looking place. I hope it's changed since I was there years ago, or anybody who pays that much had better be going just to donate to the cause, & not to get a quality show experience. Would be so nice to live in Nashville - or maybe not. SO much live music I'd be sleeping downtown on the street, afraid I'd miss something! I'm not in Nashville, but 100 miles down I-65 is close enough. I can see an early show and still drive home afterward. Later shows like in November with Lady Antebellum, Jewel, Martina McBride, Trace Adkins, & Maddie and Tae, didn't finish till after 11:00pm so I stayed over. The shows and venues are so tempting. I wanted to let EDAs know I am not trying to sell the extra ticket, I was offering free to any EDA who could make the show. I ordered the tickets as pickup at door, so both have my name. I need to change the name on the extra ticket so the user can pick it up and get the M&G identification to go backstage before the show. This is for the early show, doors open at 4:30 pm and M&G starts around 5:00 pm. Just don't want the VIP ticket with M&G to go to waste. If you can make it, please Private Message me with details and coordination. That's so, awesome. Someone HAS to go. And Mr. Joe, is a great EDA to go with. I heard she sang HEROES BY DAVID BOWIE!!! Please tell me theres video somewhere!!!! Did you take any pictures for us?? I haven't seen hardly anything from this show. I guess I should've gone & taken some good pics, 'cause that dress looks kinda hot.